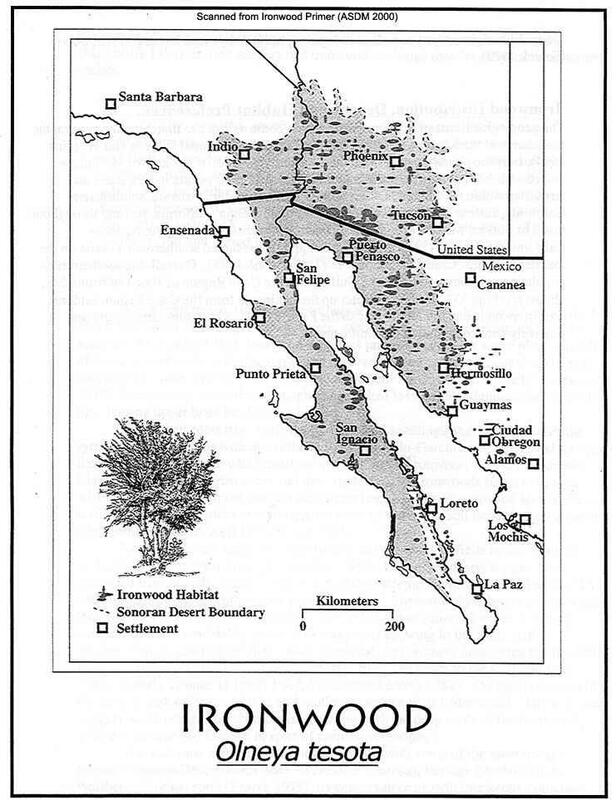 Desert Ironwood tree distribution map. 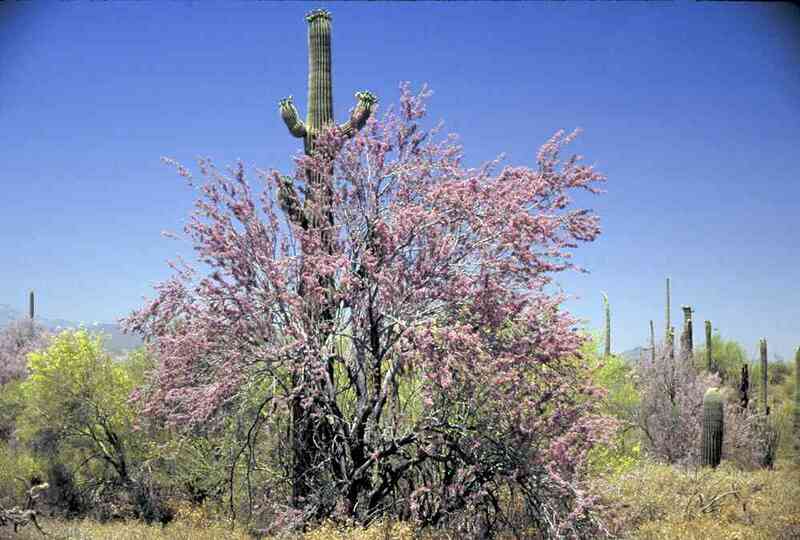 Ironwood trees grow largest in big drainages. Above left: near Indio, California. Above right: Gran Desierto, Sonora. 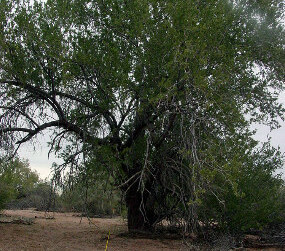 This giant specimen is in Ironwood Forest National Monument. 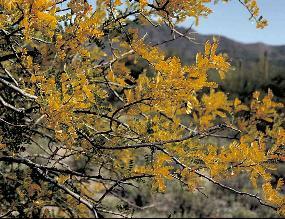 Ironwood foliage yellows and drops in April if the trees are going to bloom. 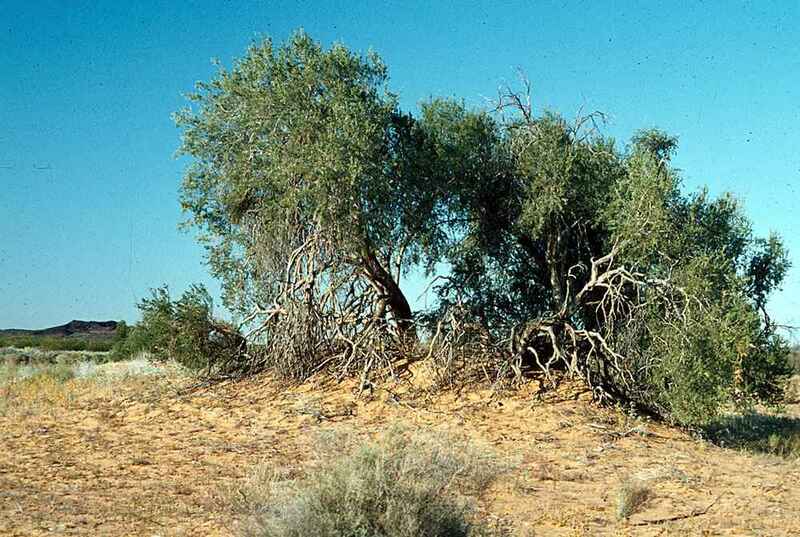 If not, ironwoods are evergreen except in serious droughts. 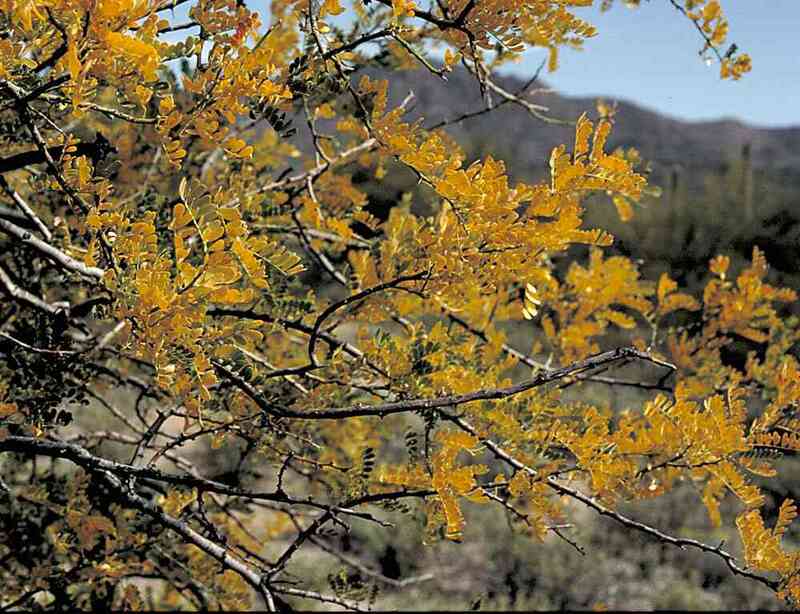 In some years only some branches shed leaves and flower. After flowering the trees releaf when the summer rains come. 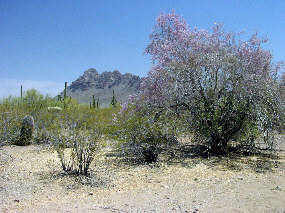 In good years (about half) ironwood trees turn lavender or purple with great masses of flower, as the tree in the Tucson Mountains (right). 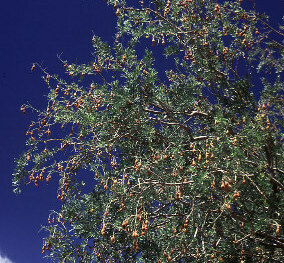 Left: a tree in moderate bloom in Ironwood Forest National Monument. Flowering usually occurs in May in southern Arizona. 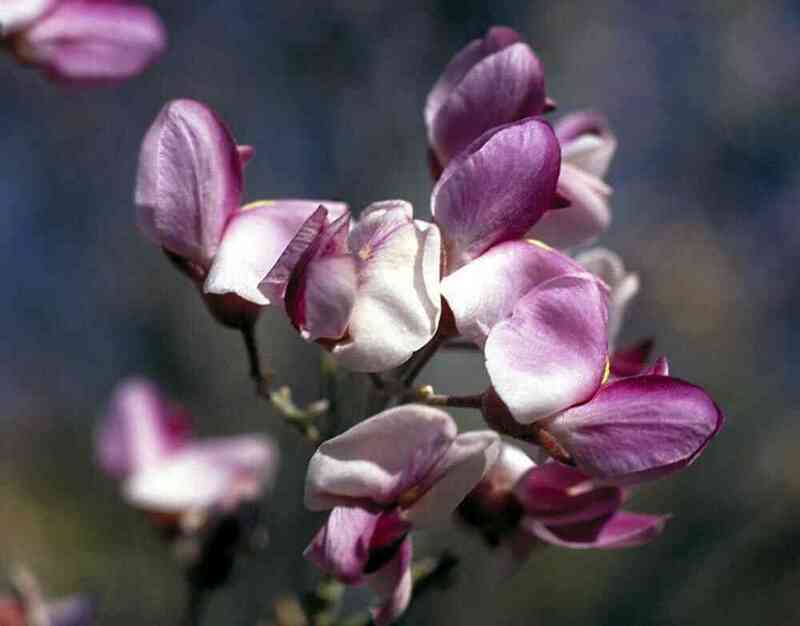 The flowers of different trees vary from pale lavender to medium purple. 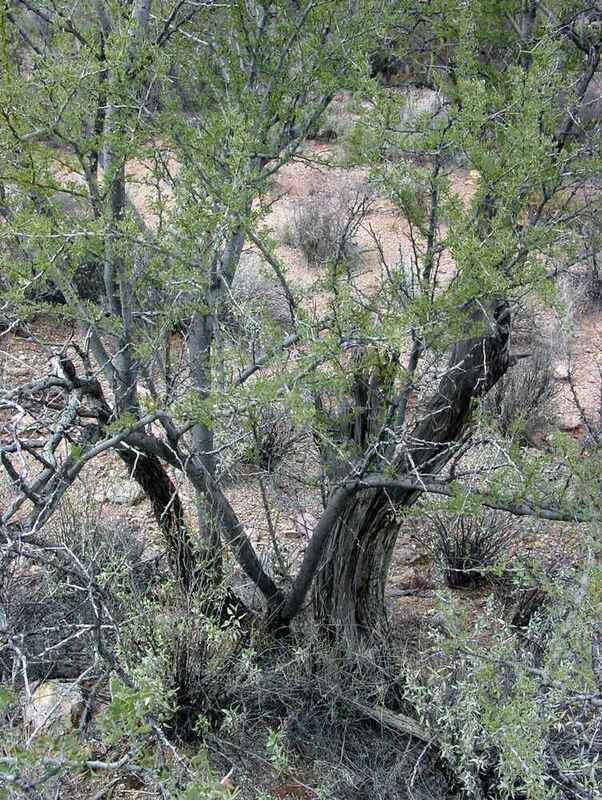 Both the above trees are darker than average. 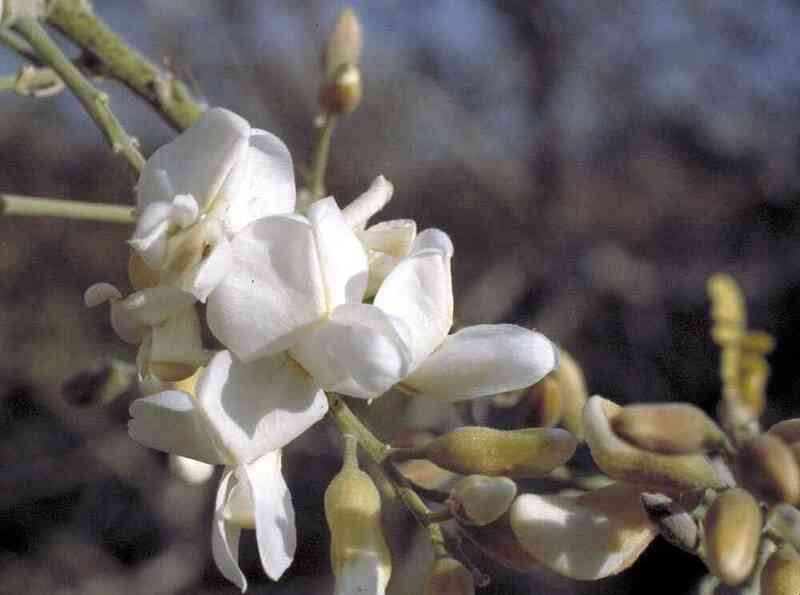 They are pollinated by various bees. 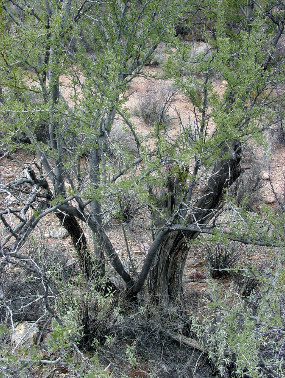 A rare white-flowered ironwood. Chuckwalla Valley, California. 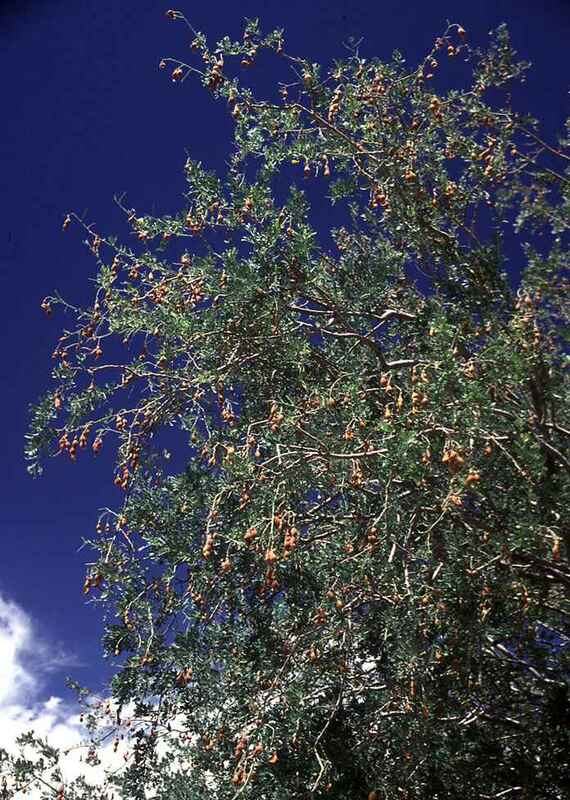 The fruit of ironwood trees is a typical legume pod. The unripe beans taste rather like strong peanuts. They probably should not be eaten in large quantities because they contain a mild toxin. 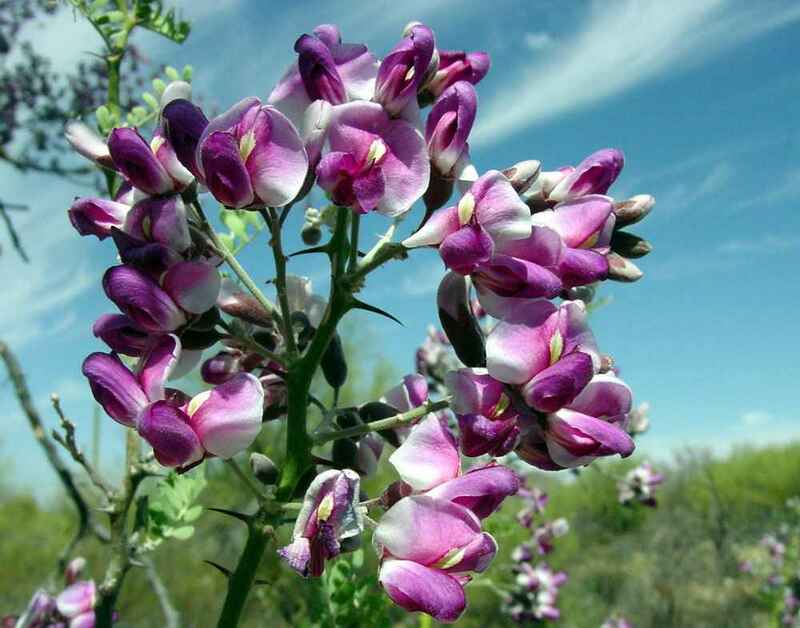 Mature beans are very hard. 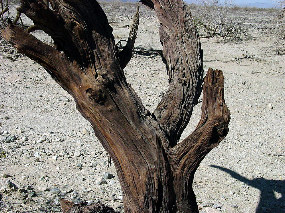 The heartwood of desert ironwood trees is essentially nonbiodegradable; it takes centuries to weather away by abiotic processes. 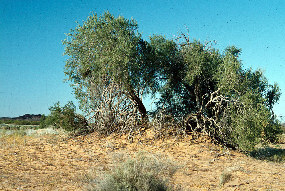 Therefore mortality must be extremely low because it is rare to see more than a few dead ironwood trees in a population. 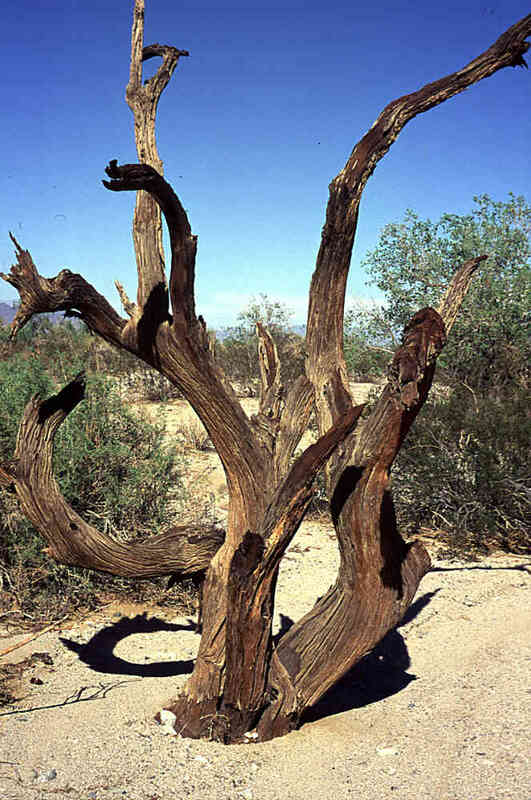 A disturbing exception: old ironwood trees in large parts of the Chuckwalla Valley (west of Blythe, CA) have been declining for at least 30 years. In some areas more than three-quarters of them are now dead. 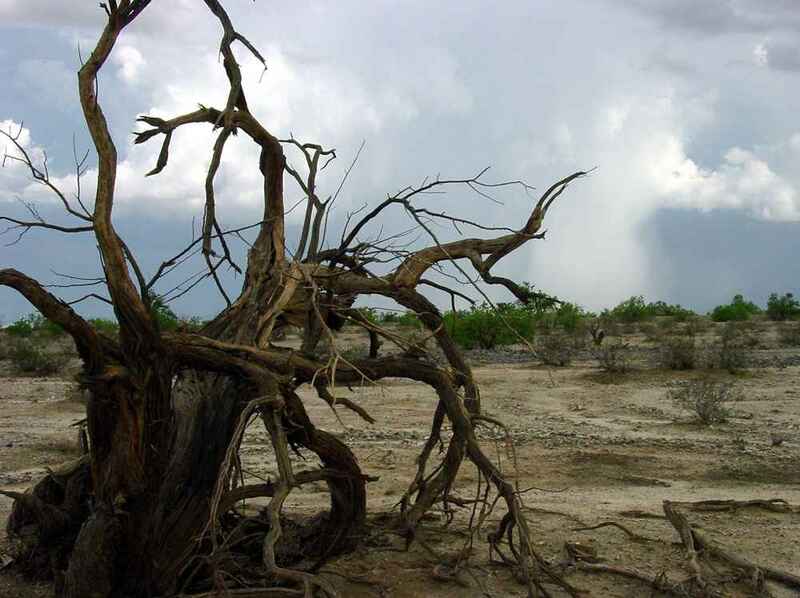 It may be long-term drought, though some suspect groundwater pumping. 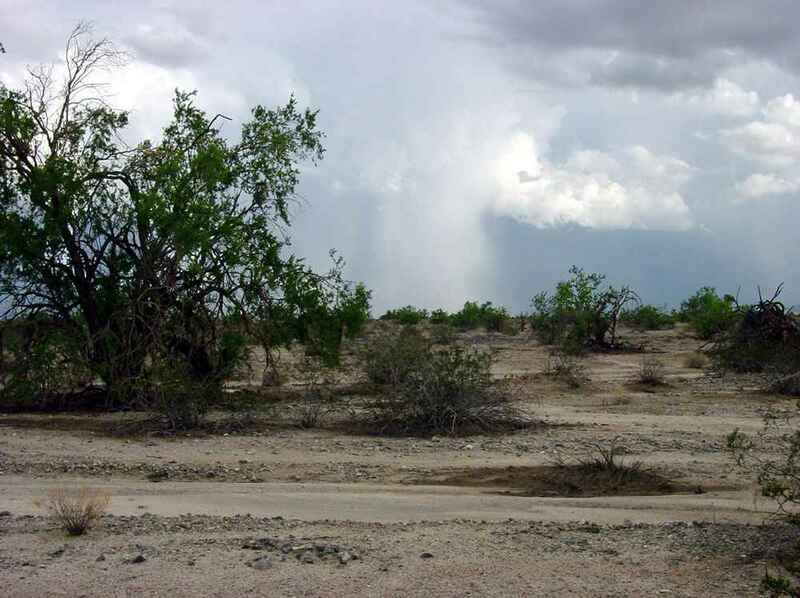 Another possibility is that the smaller drainages were diverted into larger ones that had culverts under the old highway (now replaced by Interstate 10 a few miles to the south and renamed Ford Dry Lake Rd. and Corn Spring Rd.). 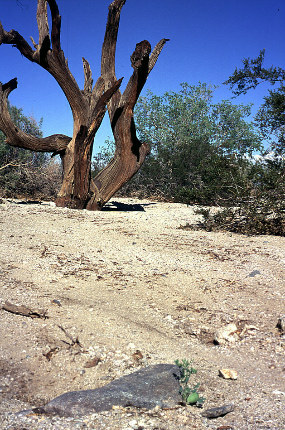 This small ironwood tree in Ironwood Forest National Monument (left) has died to the ground (topkilled) and resprouted twice. It is therefore much older than its size indicates. 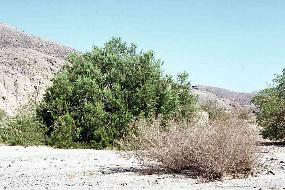 The tree in Chuckwalla Valley (right) shows the process more clearly. 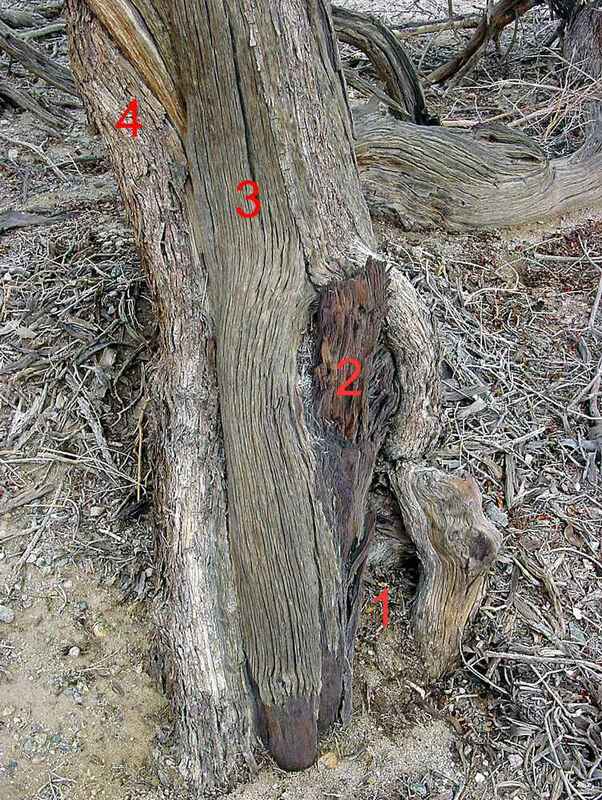 It shows evidence of three topkill events, and a fourth trunk that is still alive. 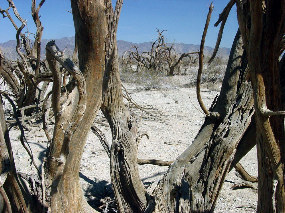 Each episode of trunk growth probably lasted at least a century in this very arid habitat which is not in a large wash. 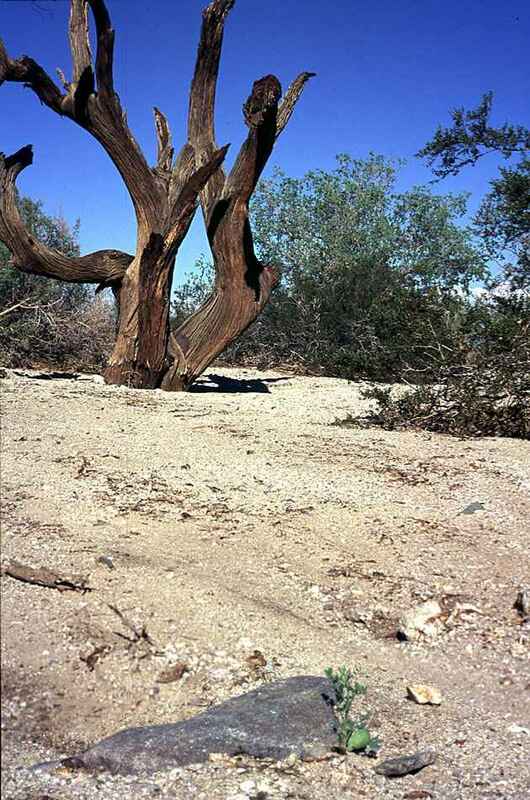 This summer storm in the Chuckwalla Valley came much too late to save the ironwood tree at left. 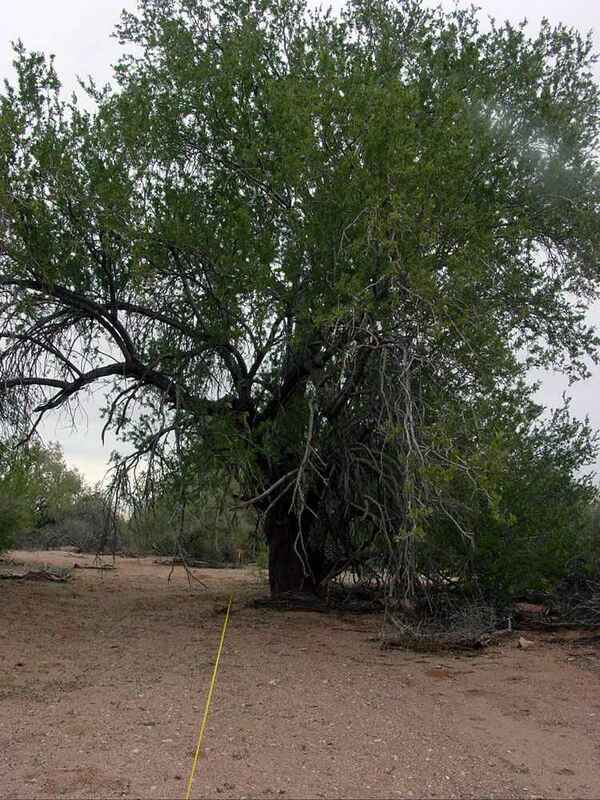 There are still healthy trees in the largest drainages. 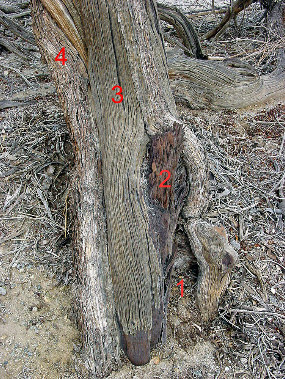 Left: Three generations of a keystone species. 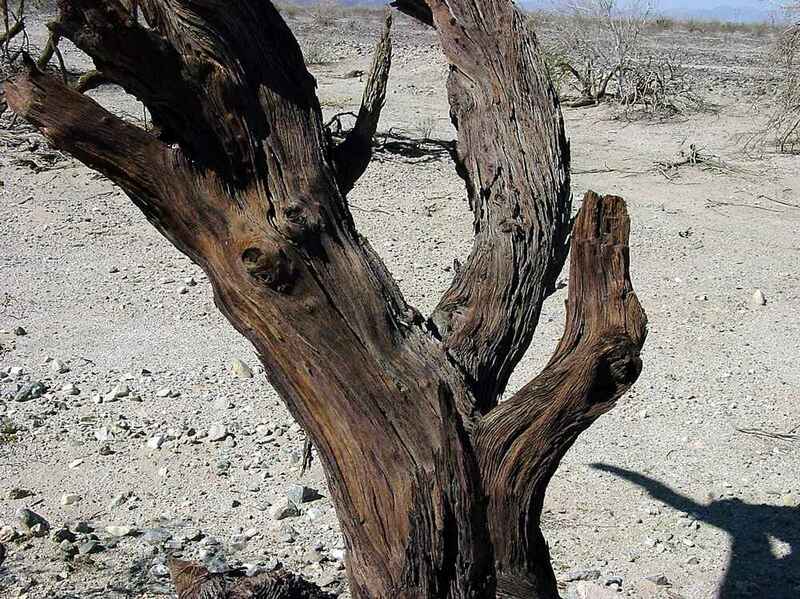 The old ironwood stump that died several centuries ago may be a grandparent of the 200-year-old tree in the background, which may in turn be a parent of the two-week-old seedling in the foreground. Bajada of Cottonwood Canyon, south of Joshua Tree National Park, California. The seedling and thousands of others germinated after an August flash flood.